“An ambitious and often moving feature, produced locally and directed by Seattle’s Matt Wilkins, "Buffalo Bill’s Defunct" is both shrewd and sophisticated filmmaking. 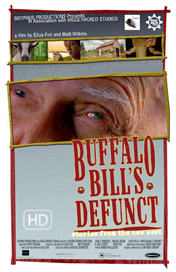 Essentially a collection of poignant short tales about the grown children and grandchildren of ornery but magnanimous "Buffalo" Bill (Earl V. Prebezac), the action begins when Bill accidentally rams his truck through a wall of his dilapidated shed. Deciding it’s time to demolish the rustic hut, widower Bill enlists his kin in removing its family paraphernalia from bygone years. This dismantling of the past becomes a catalyst for learning more about Bill’s kids (and their kids) through spare vignettes that have been compared, with good reason, to stories of the late Port Angeles writer Raymond Carver. One of the best pieces stars Keith Fox as an emotionally reckless and taciturn father whose grown daughter (Frances Hearn) reluctantly bonds with him while humiliating her drunken boyfriend (Michael White).